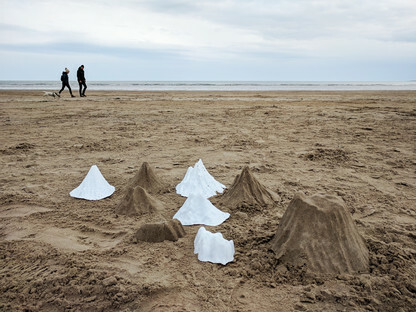 First There is a Mountain is a new work by artist and activist Katie Paterson who uses a playful, participatory approach to connect with the general public and get them to explore the wonders of our planet - mountain ranges and it's all taking place on the United Kingdom's coastline. When you're at the beach one of the most fun pastimes is building sandcastles. We see kids and adults alike armed with buckets and spades, intent on building whatever it is they want to build and it doesn't matter where in the world the beach is located. We could call it a global pastime, like the presence of mountains ranges, is also global, landmarks not only of their landscapes but also in our collective memory. In her most recent artwork, First There is a Mountain the British artist Katie Paterson combines our attraction to the mountains and the geology of our earth with coastal locations that are in turn strongly influenced by another natural phenomenon - tides. She proposes a set of buckets and spades in the form of world mountains, with each pail a scale model of five of Earth's mountains: Mount Kilimanjaro (Africa), Mount Shasta (USA), Mount Fuji (Asia), Stromboli (Europa) and Uluru (Oceania). Paterson carefully selected each mountain range for her forms via exacting research, using data from NASA’s Shuttle Radar Topography Mission and the National Geospatial Intelligence Agency. The sand pails are made using 3D technology, from 100% fermented plant starch and are fully bio-compostable. At the end of the tour, they will be composted, reabsorbing back into the natural environment from which they were created. First There is a Mountain is a collaborative cross-disciplinary project bringing together the people who will actually build the mountains on the coastline, using their buckets and spades with the celebrated authors, poets, geologists, earth scientists, ecologists, and art writers who were commissioned to write dedicated pieces of writing to accompany the artwork’s evolution.. The texts will form a digital anthology and will connect with each locality, relating the artwork to the place, its people, its history and the wider geological context. The art of Katie Paterson, faithful to her mission, which has seen her engaged for years in communicating the importance of our understanding of space, time and place, uses sand as a recurring material and symbol for time and infinitude. First There is a Mountain presents a playful approach that gives young and old alike the opportunity to have an enjoyable and interactive relationship with our world, which, for the most part, can only be saved if we become aware of what we really have. We've already got our spade in hand!